"What happened to the Children of Lir? How Cúchulainn got his name? Why St. Patrick is the saint of Ireland? What happened in Newgrange? Ireland is full of heroes and myths. Every piece of land tells a story. Learn how they became heroes and how the legends were born. Six short stories about the most popular heroes, myths and legends of Ireland. Some of the stories are well narrated, others are a little simplistic. The illustrations by Derry Dillon support effectively the narration of the legends." 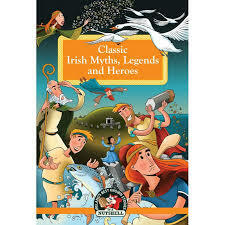 Classic Irish Myths, Legends and Heroes is published by Poolbeg Books and is available in paperback. Book Review - "Hot Feminist" by Polly Vernon. Book Review - "The Teacher" by Katerina Diamond.